Well, November’s here, Thanksgiving’s on its way and the darker nights can only mean we’ve almost made it through 2018. A lot’s happened – but there’s still plenty more to share. We’ve got the latest settlements, including how to make a settlement claim for your NIBCO PEX tubing, plus info on the most recent lawsuits against Ticketmaster and Navient. We’re also looking at what happens when companies don't tell you the truth, whether it’s about car insurance or the quality of gold in your class ring. Constant vigilance – that’s our motto. (Actually, it’s not – but you knew that, didn’t you?) Together, we can fight back. 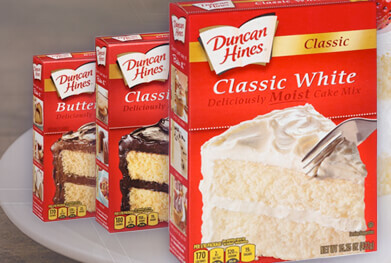 Four types of Duncan Hines cake mix have been recalled after the FDA and Centers for Disease Control and Prevention (CDC) found traces of salmonella in retail samples of the company’s “Classic White” mix. While this was the only flavor of Duncan Hines cake mix found to contain salmonella, Conagra Brands, Duncan Hines’ parent company, is also recalling Classic Yellow, Classic Butter Golden and Signature Confetti varieties out of “an abundance of caution.” The recall was issued this month and it’s not known how many boxes of affected cake mix have been purchased – or consumed. At least five people, however, are reported to have developed salmonella poisoning in connection with the tainted cake mix, though the FDA and CDC are continuing to investigate these reports. If you’ve fallen sick after eating Duncan Hines cake mix, you may now have the chance to go after the company for medical bills, lost earnings, and other damages. Attorneys working with ClassAction.org would like to hear from anyone who’s developed salmonella poisoning or salmonella-like symptoms that they suspect may be linked to the affected products. Get in touch with us to learn more about what’s going on. Allura, Maxitile Fiber Cement Siding - Not All it’s Cracked Up To Be? If you’ve experienced problems with your Allura or Maxitile fiber cement siding, you’re not alone. Allegations have surfaced that a defect in the way the siding’s made can cause cracking and other problems within just a few years of installation. A lawsuit’s already been filed in South Carolina over the Allura brand and alleges the siding’s not suitable for use as an exterior building product because hairline cracks can lead to degradation and other severe problems. These problems may include water intrusion, damage to sheathing, damage to other building components and early failure of the siding – issues that the lawsuit claims existed when the siding left the factory. If that’s true, then even when properly installed, Allura siding may be more likely to crack and fail through no fault of the building’s owner. If you’ve had problems with Allura or Maxitile fiber cement siding, attorneys working with ClassAction.org would like to hear from you. Learn more on our Allura page. What’s in a name? Well, that depends. Customers who purchased “minimum limits” car insurance from SafeAuto could be forgiven for thinking they’re getting (and paying) the bare minimum - but according to a new class action lawsuit, this coverage routinely includes unnecessary extras that many consumers don’t even realize they’re paying for. Plaintiffs in the suit argue that SafeAuto deliberately targets customers who only want the bare minimum required by state law - relying on the fact that most drivers don’t actually understand what such laws mandate - and then tacks on more than what’s needed. Specifically, the suit claims that one additional product – known as an “accidental death benefits” – is automatically and routinely included in the SafeAuto’s “minimum limits” coverage without consumers’ consent or knowledge, even though the benefit is not a legal requirement and may essentially be worthless. The lawsuit claims that this is all part of a company push to generate huge returns by getting consumers to pay for coverage they didn’t ask for, don’t need, and don’t even know they have. Sound bad? That’s where the lawsuits come in. If you’ve purchased minimum limits insurance from SafeAuto, you may be able to recover any money you’ve unknowingly paid out to the company and force SafeAuto to change the way it sells insurance. Read more. If you’ve purchased a Herff Jones ring – for example, to represent your high school or college class, service academy, or Greek organization – you should know that a class action lawsuit has been filed alleging that the rings contain less gold than the company led consumers to believe. According to the suit, Herff Jones knowingly instructs its employees to put less gold in rings that are then sold as 10K, 14K, 18K and 24K gold, possibly violating federal laws that stipulate how much deviation is allowed in such products. One plaintiff who had her ring analyzed claims that three separate tests showed it contained less than the advertised 10K gold. Do you own a Herff Jones gold ring? Learn more here. Does Navient Turn Workers Away from Loan Forgiveness Program? Nine plaintiffs have filed a proposed class action lawsuit that claims Navient fraudulently and deliberately turns public workers – including teachers, nurses and police officers – away from the government’s Public Service Loan Forgiveness (PSLF) program in an effort to make more money. The program, launched in recognition of rising costs and stagnant wages for many public workers, allows certain people to receive student debt forgiveness after 120 qualifying payments. According to the suit, however, Navient has pushed borrowers away from the program by providing false information about the program’s availability, misrepresenting which payments qualify for PSLF, advising against submitting required paperwork, and other means designed to increase profits by limiting PSLF debt forgiveness. It’s a worrying accusation – and one that affects the workers we need the most. Read more on our special blog post. Ticketmaster has long offered sympathetic notes but no real solution to the problem of scalping and mass ticket resales. Now, according to a lawsuit filed in California, we have the reason why: the company’s been propping up the scalpers all along through its “Resale Partner Program.” According to the suit, the system is designed specifically for professional resellers and allows Ticketmaster to receive a second cut on tickets that's even greater than the first cut it receives. This makes reselling a significant part of Ticketmaster’s business and, the suit alleges, explains why Ticketmaster does not police “blatantly suspicious online behavior” despite having a buyer abuse department. Read on. NIBCO Settlement: What Do You Need to Do? You may have heard that the NIBCO PEX settlement has been sorted out and anyone affected can now submit a claim. Not sure how it all works? No worries – we’ve got a great new blog post that helps you work out whether you’re eligible, what you need to do, and what exactly is covered by the settlement. The $43.5 million fund seeks to compensate all class members who have suffered proven property damage because of problematic NIBCO products. So, if that’s you, head on over to our simple guide. Progressive Insurance Co.’s Snapshot Program, which allows drivers the chance to install a device directly into their cars to gather data and potentially lower their insurance rates, is the center of a proposed class action lawsuit filed after users complained that the Snapshot device “destroys automobile batteries and damages […] electrical systems.” According to the case, Snapshot is available to drivers via both mobile app and a physical device that plugs into the car’s computer system. It’s this device that plaintiffs allege damages the vehicles they’re installed in, draining batteries even when used properly and potentially leaving drivers in unsafe situations. Progressive has apparently received more than 1,500 complaints over the past few years about damage caused by the device, as well as 8,000 complaints about the device itself. Read more. Plantronics, Inc., the makers of BackBeat FIT wireless headphones, are facing a proposed class action lawsuit after a large number of customers complained that the headphones, sold as being sweat-proof and perfect for workouts, are defective and keep breaking. The complaints mostly revolve around the Bluetooth headphones’ battery and claim that even with normal use, the headphones lose their charge, won’t recharge, and fail to turn on. The lawsuit says the company refuses to acknowledge the problem, replacing broken headphones still under warranty with identical pairs that have the exact same problem, ultimately frustrating its own customers. The suit hopes to cover all US-based customers, and you can read more about it right here.